With exceptional image quality and a compact design, this Lumix DC-LX100 II Digital Camera from Panasonic improves upon its predecessor while keeping many of its most beloved qualities. At the forefront is the large 17MP 4/3" image sensor that outputs detailed still images and captures brilliant 4K video at 24 or 30 fps. The built-in Leica DC Vario-Summilux lens has a zoom range of 24-75mm (35mm equivalent) and a bright f/1.7-2.8 aperture range, making it more than capable of handling a variety of low-light scenarios. Full manual control over exposure via on-camera dials allows for greater creative freedom by allowing you to keep your eyes looking through the 2760k-dot electronic viewfinder instead of flipping through menus. The 3" LCD touchscreen can also be used to adjust settings as well as autofocus. This sensor outputs high-resolution images as well as vibrant 4K video at 30/24 fps. The extended ISO range of 100-25600 provides a high level of versatility that expands the creative possibilities of this camera. With a bright maximum aperture at both ends of its 24-75mm (35mm equivalent) focal length, this lens provides exceptional control over depth of field and excels in low-light situations. The lens also features multiple aspherical elements and ED lenses within its 11-element, 8-group structure, that effectively deal with distortion and aberrations. Full 3840 x 2160 4K video recording is possible at either 30 or 24 fps. Additionally, individual frame grabs from video recording is done via the 4K Photo mode, which can capture full JPEG images with EXIF data from recorded 4K video. Instantly preview your images or adjust camera settings via the vibrant 3" 1240k-dot rear touchscreen. Shooting through the Live View electronic viewfinder allows you to adjust exposure settings via dials while remaining focused on your subject. The Lumix LX100 II has built-in Wi-Fi and Bluetooth connectivity options for pairing the camera with your preferred mobile device. Box Dimensions (LxWxH) 6.5 x 6.0 x 4.55"
Lumix DC-LX100 II Digital Camera (Black) is rated 3.8 out of 5 by 4. Rated 5 out of 5 by Vincent from Great Camera Image quality and lens are superb. Controls are at your fingertips. Granted I am an old school photographer but having an aperture ring and shutter speed dial accessible and not through a menu is important. The cameras auto focus is very fast and accurate. It is a photographers camera. Rated 5 out of 5 by Floyd from A Perfect upgrade from my original LX100 I owned the LX100 back in 2014. For me it was the perfect Photographers Street Camera. Plenty of features, lots of control for the more serious photographer. I sold it a while back and got a Lumix GX8 (which I still have) but had always hoped that Panasonic would bring out a newer version of the LX100 (maybe an LX200). Well this new LX100 MK II fits that bill! 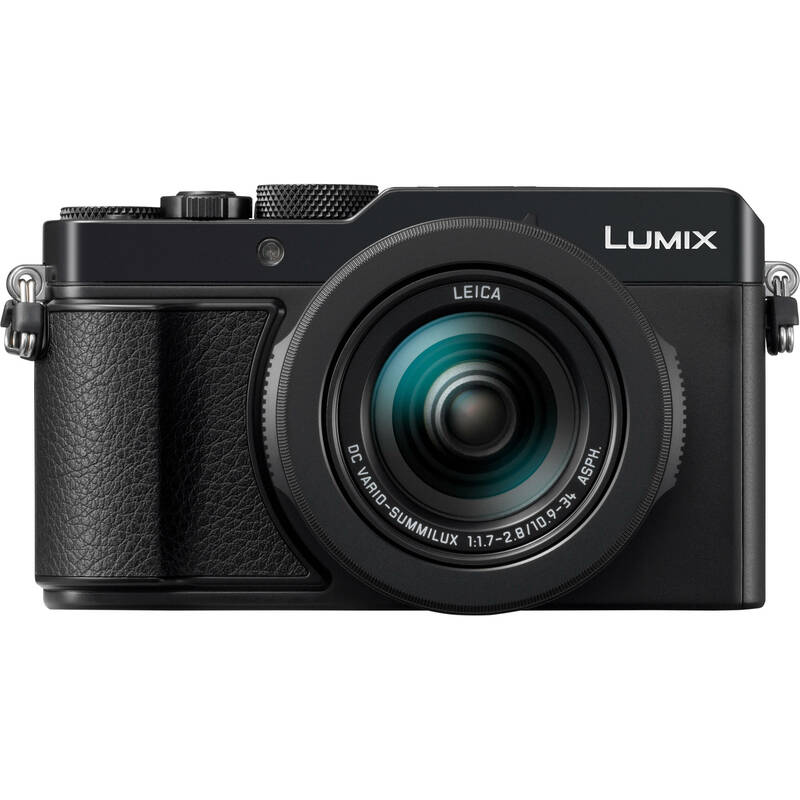 First it retains all of the Control of the LX100 while giving it a big boost with mofre features. It uses the same 20mp 4/3 sensor found in the Lumix GX9 but in the LX100 II its used as a multi-aspect ratio sensor (17Mp), so that if youre shooting at 3:2, 16:9, or 4:3 you still get the 24mm equivalent wide-angle view of the scene. The sensor also has no optical low-pass filter, which delivers sharper, more detailed images. There are now 5 Fn buttons instead of 3 and it now has a touch screen, adding 5 more virtual Fn functions. The LCD Screen is 34% higher resolution. Somehow longeer battery life by about 40 more shots. Best part all of the other greast features of the LX100 have been retained. With the free battery/charger promotion its a greast deal! Rated 3 out of 5 by Luis from To the users who want to use new LUMIX cameras RAW To the users who want to use new LUMIX cameras RAW files in older versions of Photoshop with the ACR, simply open the files in the Adobe DNG Converter and turn them into DNG format. This way you can use them in any version of Photoshops ACR. Rated 2 out of 5 by ernest from Unable to download RAW files into Photoshop 6 I just received this camera and proceeded to shoot several pictures just to check it out. I shot both in RAW format and Panasonics RW2 format which also produced a JPEG image. I was unable to open either of the RAW formats in Photoshop 6 on a Windows 10 platform. I downloaded plug-ins from Photoshop which indicated this camera was supported. No luck: still wouldnt download. Checked out Panasonic web site and no luck there either. Called B&H and their technical adviser suggested another plug-in from Adobe. Did that one as well but still couldnt down load. I am a professional photographer and cant use a camera from which I am unable to use the RAW format. I am concerned that the Leica, which is basically the same camera may have the same problem. The camera itself seems well constructed and what I was looking for after careful review of all available, but without the RAW format it is of no use to me, therefore am returning it to B&H. I might add that the personnel at B&H have been most helpful and I shall certainly continue to do business with them. Does this include time-lapse mode as well? At this time, no interval recording is listed for this camera. Does this camera have exposure bracketing for HDR shooting. If so, how many brackets? The camera comes with a Basic operations booklet; for more in depth info go to the Panasonic website and download the Advanced Operations PDF for the LX-100M2. It gives a much better explanation of technical questions such as exposure bracketing and other interesting features such as simultaneous recording of each of the four aspect ratios for each image. Will Panasonic offer this upgraded model in silver with the tan vintage leather grip as the gen1 model was offered? For now, it only is available in black. There is no indication of a silver edition available. Have they addressed the issue of dirt in the sensor? I've had to take my LX100 apart several times to clean the sensor. Reading several articles before buying the LX-100M2, some of the professional reviewers seem to hint that neoprene gaskets were added to the telescoping lens to close off dust ingress. I can not substantiate whether this is true, and have found no official info from Panasonic on this point. How do you get to a menu that shows the current battery life of the camera? Just press the Disp. Button on back when in shooting mode. The battery icon then appears in the upper right corner of the screen. The specs say there's no filter thread on the lens. The original model uses a 43mm thread . Is this a typo ? from the pics it looks like the filter thread is still there. The camera has the same lens and will accept 43mm filters. Does this camera come with an ND filter? Does the LX100 II have the ability to shoot silently? I have an LX7 that can and would like to upgrade but need a silent shutter. Yes you can shoot in Silent Mode. I set one of the Fn buttons on the touch screen to turn Silent Mode on and off so I have quick access to it.